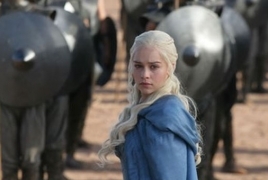 PanARMENIAN.Net - "Game of Thrones" viewers are expecting death, doom and gloom for the season eight finale. But actor Finn Jones, who played Loras Tyrell, predicts that HBO’s fantasy series will end on a high, with all corners of Westeros maintaining power in their own kingdoms, Metro reports. It’s nice to dream of a civilised ending, but even Finn admits the fairytale finale is a bit of a stretch by "Game of Thrones’" typical standards of full-throttle drama. Season eight will see characters such as Jon Snow, Daenerys Targaryen and Tyrion and Cersei Lannister fight against the army of White Walkers to claim the Iron Throne. ‘I basically don’t think there will be a throne anymore, and I don’t think there will be a centralised seat of power. Fortunately for Finn, his character Loras will miss out on the bloodbath as he died at the end of season six. So maybe not so great. Fans are still being kept in the dark about GoT’s season eight premiere date so the chance of getting details on the storyline is pretty impossible. However, actress Emilia Clarke confirmed that she finished shooting her scenes as Daenerys in May and hinted at a traumatic resolution for her beloved character. Previously speaking to Vanity Fair, Emilia said: ‘It fucked me up. Knowing that is going to be a lasting flavour in someone’s mouth of what Daenerys is.’ Maisie Williams has also filmed her last scenes as Arya Stark and teased a bloody end for her fierce character with an Instagram photo.